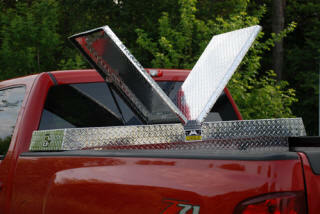 Dee Zee is another great manufacturer of truck accessories we see quite a bit of. 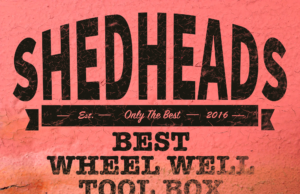 They’ve been in business since the 1970s so they know a thing or two about quality truck accessories, and their truck tool boxes are no exception. They are often contracted by vehicle manufacturers like Chrysler, Ford, Toyota and more to produce OEM (original equipment manufactured) parts for their vehicles. Their aluminum tool boxes maybe aren’t as thick as that of a WeatherGuard, but a Dee Zee tool box should last you years, and with their limited lifetime warranty, possibly a life time. There are tons of options out there to choose from, so our team has put together the Best 3 options on the market for you to choose from. We’ve focused each full review into this nifty comparison chart. Use it to make a quick decision, or read each full review below! The first on our list is their standard crossover model. 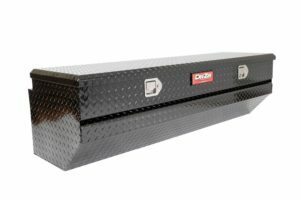 If you drive a full size truck and need a secure place to store your tools (that’s not the back seat) then the 70 inch Dee Zee tool box should fit your needs. The crossover style is definitely the most common, spanning the width of your truck bed and mounting to your truck bed rails. 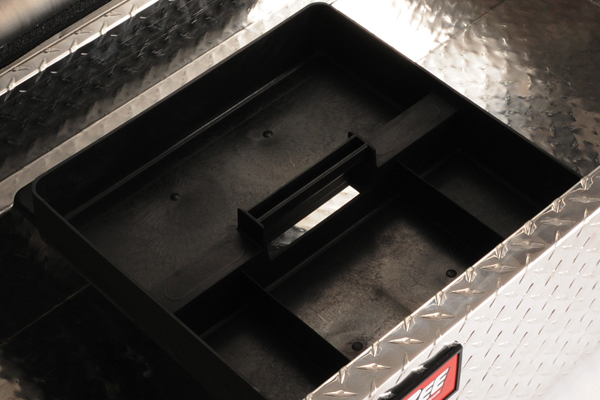 A thick, heavy-duty plastic tray is included with the box to keep small tools and gear separate and organized. It is manufactured from heavy-duty aluminum, maintaining a light weight while still providing a rigid sturdy container for your tools. You can tell the welds have been performed with care, and add strength to the box. Dee Zee has also included a Double-V stiffener to the lid of the box, which helps reinforce the lid adding rigidity. The self-centering lid strikers auto-adjust so that the box will close tightly, eve n if warm or cold weather expands or contracts the aluminum slightly. The stainless steel handles won’t rust, and of course aluminum is naturally rust-resistant. There are two finishes available, a nice black powder coat or the clear shiny aluminum finish. Since they don’t add any corrosion resistance, it’s purely cosmetic and you can just choose the finish that fits best with your truck. There’s no point in storing your tools in a box if it’s not going to keep them safe. It has a deadbolt style lock mounted into the left-side paddle handle that locks up your tools tight and safe from thieves. The design of the lid and the way it closes over the tub of the box helps to prevent someone prying into it. The lid also features a closed-cell foam gasket which lines the interior of the lid. The gasket acts to lock out moisture and dirt, so that your tools stay clean and dry. There are also two dampened gas shocks that smoothly assist opening of the lid and keep it open while you’re getting your tools. 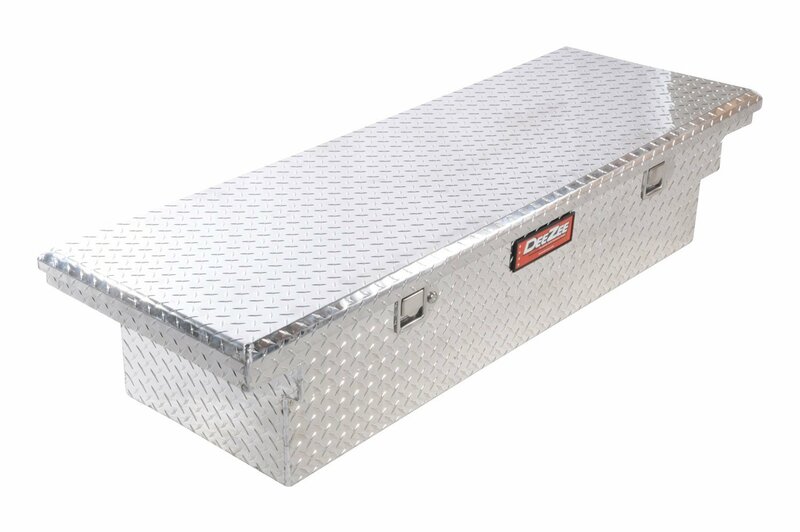 This Dee Zee tool box is designed to fit full sized trucks. The box itself measures 70 inches long, which is the length that the box will span the bed of your truck. The lid is thin, maintaining the box’s low profile so that the view out the back window of your truck is not impeded at all. It is 12 inches high, and so should hang down in your truck bed, not touching the floor. This is great so that your hauling capabilities aren’t hindered too much and can still use the full width of the truck bed to pull lumber and other longer loads. At 20 inches in depth it’s not the largest truck one we’ve ever reviewed, so if you have a ton of tools, you may need to consider a bigger option. Installation is super fast and easy like most crossover boxes, using simple J-hooks to fasten the box to your truck’s bed rails with no drilling required. 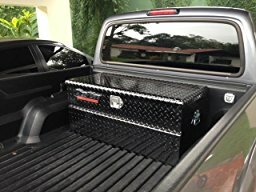 Dee Zee makes some pretty good tool boxes, and this is a great option for those needing to add storage to their truck. Overall, the materials that Dee Zee have used are good, with stainless steel components and rust-resistant aluminum. The aluminum is a little on the thinner side, but is still pretty heavy-duty. The lid is reinforced and is quite strong and sturdy. The low profile doesn’t impede your back view at all. It’s not the largest box you can get, so keep that in mind. Some folks have issues with their boxes arriving with dents and dings after shipping, so make sure you inspect the box immediately after receiving it. 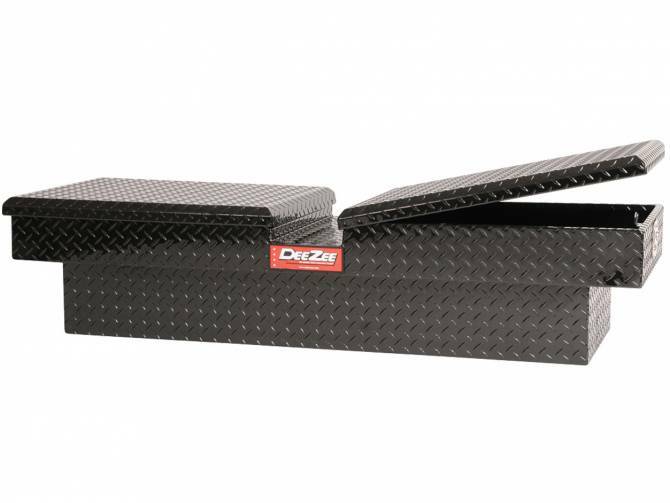 Overall, this Dee Zee tool tool box makes a great affordable option for those with full size trucks. Next up on our list is this Gull Wing Style. This box is a crossover style similar to the previous, however instead of a single lid, there are two gull-wing style lids. The lids open towards the middle of the box and can make it much easier to access your tools in certain situations. 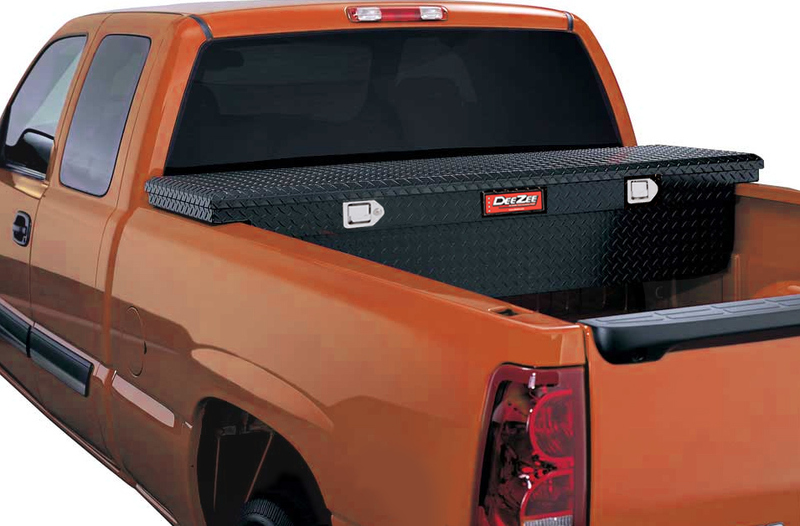 Single lid boxes often require you to get into the bed of your truck to get to your tools, but this gull-wing Dee Zee tool box will allow you to easily access your gear from the side of your truck. The lids open to the same main compartment, so you can still easily store longer tools like a 4ft level. There is also a thick plastic (removable) tray included with this box so you can keep your smaller hardware and tools more organized. This box will sit higher on your truck bed than the low profile box so keep that in mind as well. 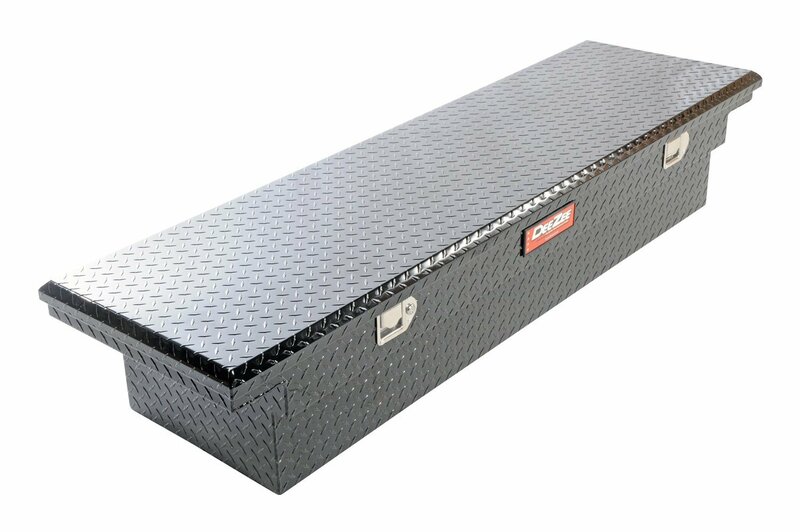 This tool chest is made from the same 0.056 grade aluminum. It’s not the thickest walled box you can get, but it’s still plenty sturdy and helps keep the weight down. 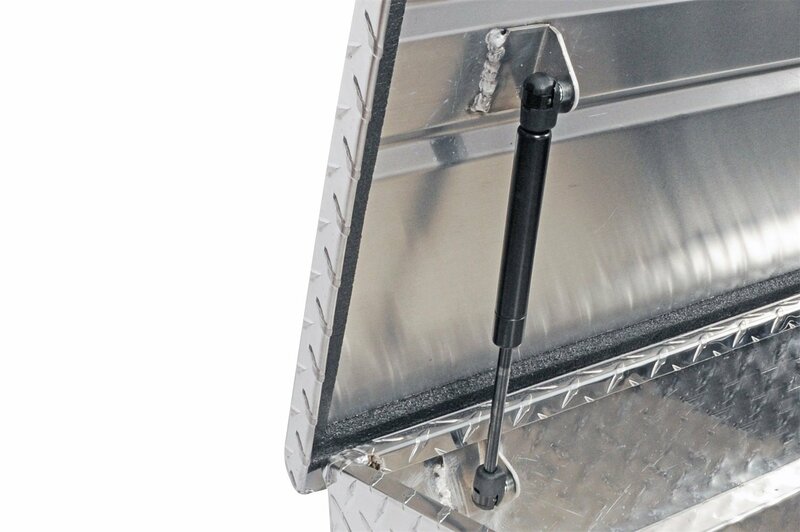 The stainless steel paddle latches won’t rust, and the aluminum of the box itself is rust-resistant. The three piece body is strong and sturdy, and the double V-pan stiffener on the lids help reinforce them enough you can stand on the lids without fear of damaging the box. This box is also available in Dee Zee’s glossy black powder coat, or the shiny aluminum model with a clear protective coating. Because of aluminum’s natural rust-resistance, the finishes are only for their looks. The gas shocks on the lids help lift the lids smoothly and with little effort. Like the previous model, it features the same closed-cell foam gasket that acts to weatherproof the box from the elements. The gasket lines t he circumference of the lid and makes a tight seal with the tub of the box to keep water and dust out, maintaining a clean, dry interior. Both lids of this gull wing model have a double cylinder deadbolt lock so you can lock your tools up safely. Because of the overlapping lid design, it would be very difficult to pry into the box. This gull wing model is designed to fit full size trucks. 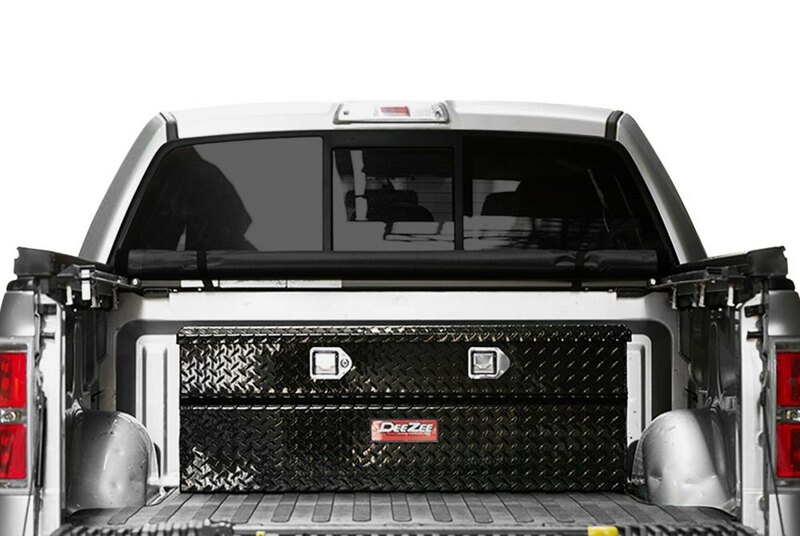 It measures 70 inches in length, so you need to make sure your truck bed can accommodate it. The box measures 12.5 inches high, so it will likely hang down into your truck bed without t ouching the floor, maintaining some of your bed space. The box is 20 inches wide, and so although it isn’t the largest gull wing model you can buy, there should be plenty of storage space for most folks. 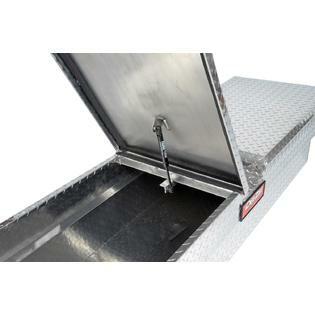 If you find yourself needing some extra storage, you can always supplement your truck with a side mounted box. Installation is the same as all crossover style boxes, using J-hooks to securely mount the box to your bed rails, without the need for any drilling at all. There are only a few major differences between this gull wing Dee Zee tool box and the low profile box we reviewed above. If you think you will be in and out swapping tools frequently throughout the work day, the gull wing model may be a better fit for you, since it is much easier to access your tools from the side of your truck. However, the box will sit higher on your bed rails reducing a small amount of visibility out of the back window. Some people love the simplicity of the single lid models, while many swear by the gull wing style. It all depends on your preference. It is manufactured well, but the aluminum is on the thinner side and you need to watch for it arriving with dents after shipping. This is great and affordable option nonetheless, and should you last you ages, and the limited lifetime warranty isn’t a bad bonus either. 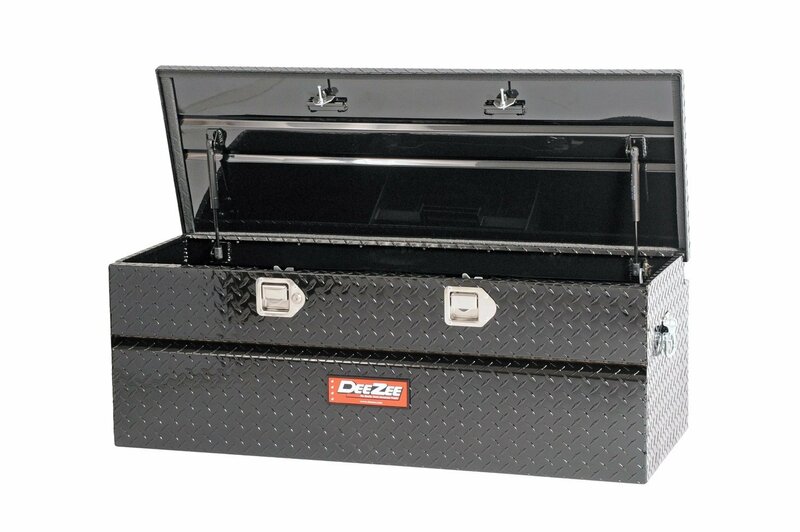 The last Dee Zee truck tool box on our list is this Chest style box. Chest truck boxes are great for a few reasons. 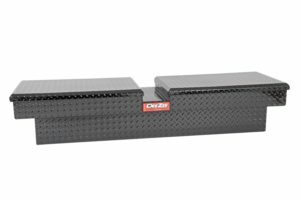 Since they sit directly in your truck bed, the bed rails are left open and so these boxes can be easily used in combination with a canopy or tonneau cover (depending on the height of your truck bed rails). The uniform rectangular shape provide a large amount of storage space, and they can easily be removed with the included stainless steel handles and used as a utility chest off your truck if needed. Some folks find the aluminum a little on the thin side. However, the thinner walls allow the box to maintain a lighter weight, great for fuel economy and versatility. The lid itself is very sturdy, with the double-V reinforc ed design making the lid so strong you can stand on it care-free. Dee Zee makes a shiny aluminum finish of this box, but we find it much easier to find the black powder coated model (and let’s be honest, it looks way better). The stainless steel paddle latches won’t rust, and neither will the aluminum body. 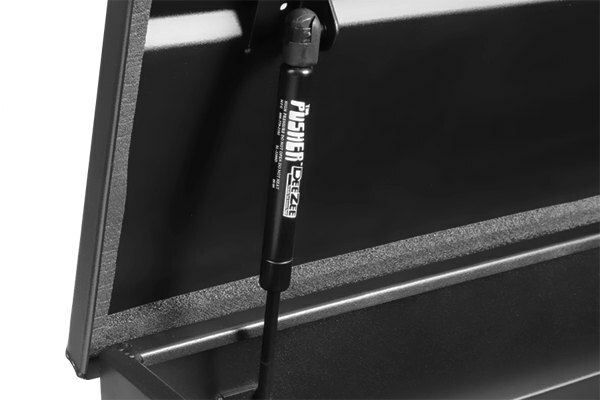 The gas shocks help to smoothly automatically lift the box up to almost 90 degrees. The left paddle latch of the has a strong lock so that you can safely leave your tools inside without fear of someone making off with your expensive gear. Although the aluminum is slightly on the thinner side, it’s still plenty thick and won’t be easy to pry or torch into. The foam gasket that lines the lid acts to keep out water and dust particles from the outside world. It’s not quite as effective as a rubber weather strip we see on some other tool boxes, but only in heavy rain could you see any leakage. It’s an easy fix to beef up the weatherproofing if you get any leaks. This chest style Dee Zee tool box is unlike the crossover models above as it sits directly on the floor of the truck bed. As a result, the space of your truck bed will be slightly reduced. However, because the bed rails are left open, you can use this box with a canopy or tonneau cover. You will just need to double check the height of your truck bed and make sure that the rails are taller than the 16 inch height of the box. The box also has a length of 47 inches and width of 19 inches, so it should fit most mid sized trucks. There is also a larger version available, if you need extra storage for your full sized truck bed (56 inches long, 19 inches wide, 16 inches tall). Installation for chest style truck boxes is a little more arduous and intrusive than crossover models. It is recommended to drill holes into the bed of your truck to securely fasten the chest. If you don’t want to do any drilling and will always be using a tonneau cover or canopy, you can rely on the locking mechanism of your cover, and just strap the chest down in the box to prevent it from sliding around while driving. Chest tool boxes like this one have awesome versatility since you can use them with a tonneau cover, canopy, or elsewhere off your truck. Installation is a bit more of a hassle however. The aluminum design is sturdy and strong, though a little on the thin side. The lid is very strong and reinforced, but the walls of the box may dent a little easily. The weatherproofing could be better, but the box locks securely and will help keep your tools safe from thieves. 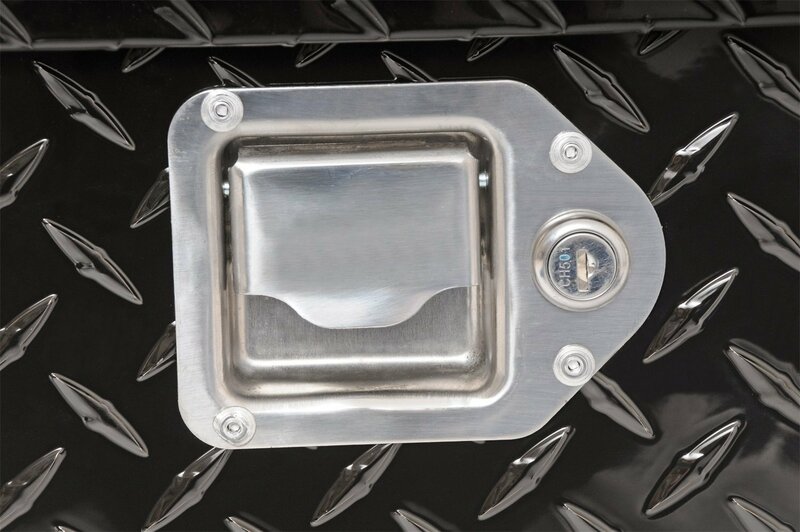 The black finish looks great on the diamond plate aluminum and this chest will make a great affordable companion for your mid sized or full sized truck. You can order the mid sized or full sized chest from Amazon and have it shipped straight to your door! Did you find this article helpful? Post your questions or other comments below! We love hearing from our readers!